Winter won’t last forever (although it has been very cold and snowy here on the prairie just across the river from the great city of Kansas City, MO) so I am already looking forward to planting my garden in the spring. I plan to get a head start, but I am also going to try growing some herbs inside which I am told is an easy and good thing to do in the winter. First up is growing basil, like from the Italian Large Leaf Basil Seeds I found from the fine folks at Botanical Interests. 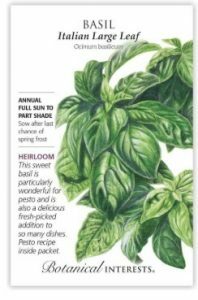 Find the Italian Large Leaf Basil Seeds from Botanical Interests here. See all the herb seeds from Botanical Interests here. Visit Botanical Interests online here. I never had good luck growing flowers from seed, so this year I am determined, and I think the trick is to start early. 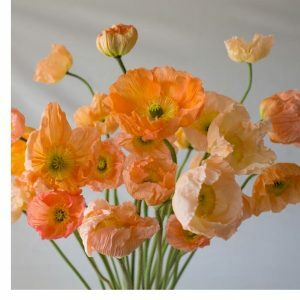 I hope to grow some cool flowers, like the Giant Peach Iceland Poppies I found from the fine folks at Floret Flowers. Find the Giant Peach Iceland Poppy Seeds from Floret Flowers here. Visit Floret Flowers online here. Lost Cowboy is powered by	WordPress 5.0.4 and delivered to you in 0.815 seconds using 40 queries.